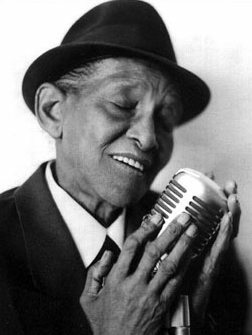 Jimmy Scott broke my heart last night, as he has every time I’ve seen him perform. His voice is so distinctive, his style so unique, his story so compelling that unless you’re made of stone, you will be touched by this remarkable artist. Never robust, he’s very frail at 80. He walks with great care onto the stage. The members of his trio are vigilant and respectful. Pianist Aaron Graves rises to lend a hand and turn a page of the papers (we suspect it’s the lyric sheets) on the music stand in front of Scott; bassist and music director Hilliard (Hill) Greene reminds him once of what song comes next. Scott doesn’t banter with the audience much. But when he opens his mouth to sing, he is transformed and so are we. Scott and the Jazz Expressions trio—Graves, Greene, and drummer Dwayne Broadnax—are in Minneapolis for a two-day engagement at the Dakota on Monday and Tuesday, October 10–11. The second set on Monday began with an instrumental by the trio, and then Scott came slowly through the curtain. Many members of the audience rose to their feet to greet him. At some point early in the show, after the first song or the second, Scott said, “There’s no business like show business.” It’s evident that after all these decades, he loves to perform. He seemed to grow stronger—his voice, even his posture—as the set progressed. He drew energy from the audience, then turned around and gave it right back to us. Blues giant B.B. King is also 80; he’s just released a new CD of duets (called “80”) with the likes of Eric Clapton, Van Morrison, John Mayer, and Elton John. King still sounds like he could punch your teeth out. Scott is doing some collaborating of his own. On Saturday, October 13, he’s scheduled to make a special guest appearance with recent Mercury Music Prize winners Antony and the Johnsons at Carnegie Hall. Antony performed at the Woman’s Club in Minneapolis last Thursday, October 6; he is (as Rolling Stone described him) “a ghost-white giant with a voice of singular majesty.” Jimmy Scott is a wisp of a man with a voice of sheer will, spirituality, and passion. I envy those New Yorkers who will see them together. What a show that will be.